My friend just posted a picture of her key to instagram and it occurred to me that with such a high res photo, the dimensions of the key could easily be worked out. Therefore the key could be duplicated. What's to stop someone malicious from abusing this? This has already been done for many years, with keys being cast or created from blanks using hand drawn copies, photographs, remembered shapes etc all being successfully used, both by locksmiths and criminals. 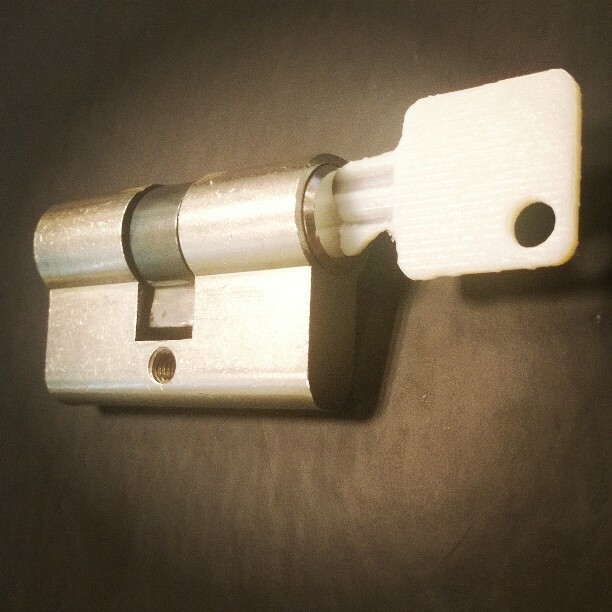 A 3D printed key will do just as well, if strong enough, or it could be used to cast a key if necessary, or as pointed out by @EkriirkE - you could use a torque bar to turn the barrel. You should not ever post picture of keys to a public site, unless it is for something unimportant. As the guys previously said, nothing! I am trying to do duplicate a key from a single photo, with some assumptions to make it a realistic problem such as having a coin of a known size next to it for size calibration and rotation, almost symmetry between the two sides of the key etc..
My target is to automate the whole process, i.e you take a single photo and an app will detect the outline of the key and the grooves inside it (which is a really difficult problem since it's a reflective field) then construct a 3D model ready to be printed. Rendering of a key with its grooves! There have been a couple of researches about this in the States and Thailand, but: 1) the states': you take a photo and point out the points of interest 2) Thailand's: a reconstruction from a video-stream of the key. Meaning that none is absolutely automatic, but they're still good nonetheless. I have also found an app for iDevices in which you can take a photo of the key and send it to a company which will then duplicate it and send it back. I have always laughed at this and said: yeah, the mailman will knock on your door and if you're not home he'll simply enter the house, put the key and leave with everything else. 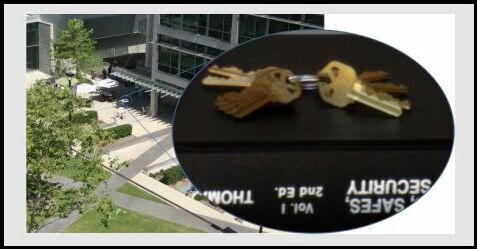 Our SNEAKEY system correctly decoded the keys shown in the above image that was taken from the rooftop of a four floor building. The inlay shows the image that was used for decoding while the background provides a context for the extreme distances that our system can operate from. In this case the image was taken from 195 feet. This demonstration shows that a motivated attacker can covertly steal a victim's keys without fear of detection. On one occasion, a convicted killer in Australia actually duplicated a master key of his own prison cell just by looking at the physical keys carried by the guards. He successfully escaped from prison and was on the run for 12 days before being captured. So if a prisoner with only raw metal and a good memory can copy a key, I think that an actual photograph and a 3d printer would work flawlessly. Every single day when "locking up my house" before leaving for work, I chuckle at how pointlessly stupid the whole practice of "keeping things under lock and key" in this day and age of technological expanse. As a locksmith I can tell you that some locks have tolerances that are measured in the thousandths of inches (tens or hundreds of micrometres), and getting a perfect match isn't always a guarantee. What would actually stop someone? The fact that picking a lock is easier, and quicker (in most cases) than making a key from an image or 3D scan, even if I have precise measurements. Regardless of the tolerances, a skilled locksmith can pick a lock in less time an with more certainty than making a key from a photograph***, or even a 3D scan. If the lock has crappy tolerances, it is most likely not a very secure location, and anyone wishing to gain entry is going to kick the door in to minimize the amount of time they are on scene. They aren't going to bother with picking the lock or trying to 3D print a key. The exception is high-security locks, like Medeco. These are virtually unpickable and are usually in secure locations, but you'd need a very specific set of photographs, a high-res 3D scan, or some other means of finding not only the keyway (shape of the key shaft) and depths of the cuts, but the angles of each cut as well. Simply "jiggling" a wrongly cut Medeco key won't get you anywhere. Many thieves would just as soon "break in" meaning use force to enter without a key. It's a surer bet, quicker than opening with a legitimate key or picks, and they aren't trying to hide their tracks anyway. Hello, I'am new here. I recently bought a replicator 2 and was trying to come up with something interesting things to print after i got tired of making jewelery and toys... I thought it would be cool to see if the resolution would allow me to make a working house key from a picture I took. After finally getting the cross section measured out correctly the tooth pattern was easy. I think I'm going to try a car key next but I'm a bit worried the PLA won't be strong enough. We'll see. here is a video of me making, and using it. The 3D printing option might be more attractive for some of the nasty "do not copy" keys commercial landlords, universities, etc. like to use (where blanks are not readily available, or where cutting on the inside of the key would also be needed to make a working copy). People without TV/Youtube: nothing at all (as pointed out in other answers/comments). Why waste money and effort, when your average basic bump key set is cheaper, re-usable and works for 80% of the locks? Just hope the target has expensive locks, then it works even better (this is a must see video). Once you understand this principle, we can understand the 'big guns': the (lock-)pick-gun, as used by law enforcement. upside: fits even more average locks because you don't need to pick the right bumpkey from your set. Although these can be bumped too, sets are more rare and printing them from one photo wouldn't work since 4-sided and round models exist as well. a lock is intended as a time-consuming puzzle (the key is an instant solution). yet in reality the vast majority of locks can be opened just as fast as with a key (without 007 hair-pin 'art'). What's to stop it? Honor, as sense of morality, knowing the difference between right and wrong, respect for other people, and their property, and when that fails, a .357 Magnum and a bad attitude usually suffices. Locks were invented to keep honest people honest. The locks most people use in every day life are considered "privacy locks," i.e., if someone wanted in you couldn't stop them, and they won't need any "fancy-smancy" 3D printer. Electronics inside the key that are mandatory - e.g. some car keys have a chip in them, such that the car needs both the physical key and the electronics to start. The lock requires the key to be a special material that isn't 3D printer friendly. Perhaps the lock requires the key to have specific electric conductivity, strength, light refractivity... just thinking off the top of my head here! Basically some interactivity that can't be replicated with your standard 3D printer. Nothing at all, but a better question is how much does it really matter. Most (effectively all) consumer locks are useless. They can easily be bumped, picked or bypassed entirely (go through a window). Primarily, locks keep honest people honest, but don't do much for preventing criminals from being criminals. 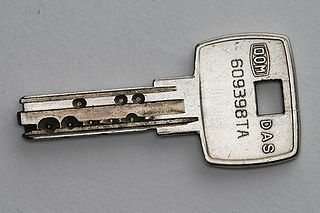 If it was actually a photo of a key for an actual secure, multi-direction lock, then it might be more of a problem, though extracting the exact dimensions for such a key from a picture might be slightly non-trivial as it would involve having to make some guesses about shape and size since the photo is 2d and angles may vary. Overall, I personally wouldn't be too worried if a picture of my key was posted somewhere. I wouldn't intentionally do it, but the chance of someone specifically finding the photo and using it to break in is pretty minimal. Posting when you are going to be on vacation is a FAR bigger security risk and most people don't think anything of that either. Not the answer you're looking for? Browse other questions tagged physical locks or ask your own question. How much information can be obtained from observing someone type their password?